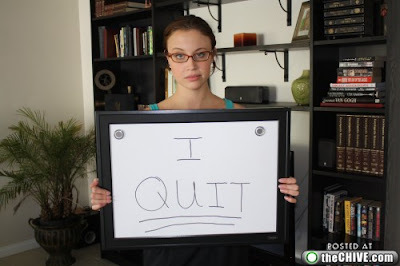 How many times, I wonder, have we all dreamed up creative and dramatic ways to quit a job? Here, are two inspired options. Yesterday, a JetBlue steward called it quits via escape hatch, and word comes this afternoon of a young woman publicly tendering her resignation via dry erase board, outing her boss's skuzzy behavior--and embarrassing Farmville habits-- in the process. Of the two, I'm more likely to go out like the former. Which is to say in shackles. I lack the latter's calm resourcefulness. I'm much too much volatile for 35 dry erase boards. UPDATE: Turns out this second quitting is probably a hoax. You know, it's getting to the point where you can't believe everything you read on the Internet. And yet the Times, the paper of record, comes through with this 1947 story of William Cimillo, a Bronx bus driver who commandeered a Surface Transportation Corporation bus and drove that baby 1,300 miles south to Florida.